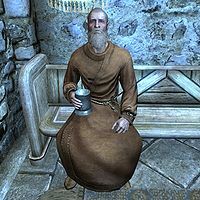 Andurs is a Nord priest of Arkay living in the Hall of the Dead located in Whiterun. He tasks you to find his Amulet of Arkay which helps him perform the death rituals. The amulet was unfortunately dropped in the catacombs within the halls of the dead and Andurs will not go in due to strange noises. Andurs lives a secluded existence inside the Hall and never sees the light of day. His bedroom is located in the western wing and he sleeps there every night between 8pm and 8am. After waking up he wanders about all day long until his bedtime, at times sitting down on one of the benches to relax, eat, or sleep. Andurs wears a set of monk robes along with a pair of boots. He wields an iron dagger and carries a selection of common loot and gold. Andurs is quite eager when he sees you, saying: "I spend so much time among the dead, I sometimes forget how much I miss the company of the living." He will discuss the impact of current events on his job, saying: "With this terrible war, I'm a bit overwhelmed. As are the catacombs." He'll also talk about his life's work: "As Whiterun's priest of Arkay, I spread his word whenever I'm able. In the meantime, most of my hours are spent with the city's dearly departed." During Pilgrimage, Alessandra will ask you to deliver her father's dagger to Andurs. When you bring Andurs the dagger, he'll be touched: "She finally decided to return it to her father. Bless her heart. I will make sure this finds its way to his tomb as soon as possible. Thank you for bringing it, my child." When exiting conversation, he'll say: "The blessing of Arkay be upon you." or "Walk always in the light, in these days of darkness." No matter what option you selected, you will now be able to ask him what he lost: "My Amulet of Arkay. It's the source of my divine powers and also a sacred badge of office. I misplaced it in the catacombs. I'd look for it, but I've been hearing noises down there. I fear the dead have become... restless. Without that amulet, I'm powerless to confront them. Would you be willing to search for it?" If you decline, he'll say: "So be it. I'm sure Arkay will find it in his heart to forgive you... eventually." If you accept, he'll say: "I'll just wait here and make sure nothing foul escapes the catacombs." Once you bring back his amulet, he'll be grateful: "Oh, thank Arkay. Please, take this gold for your troubles." Andurs' Arkay Amulet: Retrieve Andurs' Amulet of Arkay from the catacombs. An unused line of dialogue was recorded for Andurs. You were supposed to be able to pick up his amulet without talking to him and bring it as a surprise. However, the amulet will only spawn when he has given you the quest, so the dialogue can never be heard: "Can it be? You've brought me my amulet? Oh, thank Arkay. And thank you. Oh, dear friend, please, take this gold for your troubles." This page was last modified on 13 June 2014, at 18:42.